In short, the answer is a big NO! Performance motorcycle tires that are manufactured specifically for the front and the rear of the motorcycle may not only have different tread patterns, but also different tread pattern directions. Take a quick look at the set of Pirelli Angel CT’s mounted on my Pulsar 200NS. Both pictures were taken from the front of the motorcycle. My set of Pirelli Angel CT after travelling some 6,000kms. In such tires, not only is the FRONT and the REAR stipulated, the direction of travel is also inscribed onto the side wall. For proper installation, you’d want to install in such that the tires are rotating in the correct direction of travel when the motorcycle is moving forward. Front tire and the direction of travel. Picture taken from the left hand side of the motorcycle. Rear tire and the direction of travel. Taken from the left hand side of the motorcycle. The next question then is, why is it designed as such? The main reason is that the front and the rear tires experience different forces. The rear tire is primarily used for acceleration and propelling the motorcycle forward. Whereas the front tire experiences the greatest forces during braking. And thus, the treads are designed with these primary forces in mind. Let us first take a look at the tread pattern on the rear tire. 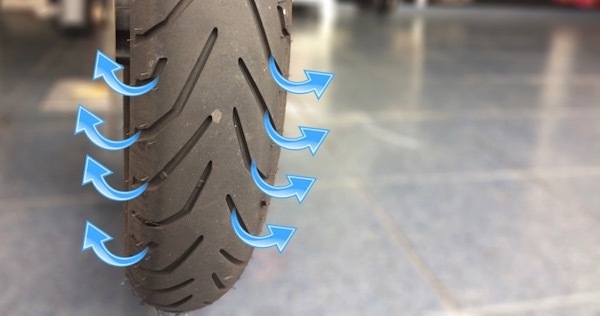 As the motorcycle propels forward and the tire rotates, and if the road was wet, the grooves on the rear tires are designed to “push water to the side”. This makes perfect sense as you want minimal water to get trapped between the road and the tire surfaces to maximize grip. Then the logical question to now ask is – why does the front tire then appear to “push water to the centre” as the tire is rotating forward? Wouldn’t then this cause aquaplaning? What are the design engineers even thinking? Firstly, you need to understand that aquaplaning affects motorcycles and cars in slightly different ways. At similar speeds, cars are more prone to aquaplaning as compared to motorcycles. Why? This is due to the vastly different shapes of the 2 vehicles. Without going into the specifics of Bernoulli’s Principle, cars are shaped very much like airplane wings – also known as aerofoil (British) or airfoil (American). Bernoulli’s Principle of lift forces on an aerofoil. Lift forces acting on a car according to Bernoulli’s Principle. At higher speeds, cars get “lifted” due to the pressure differences at the top and bottom of the vehicle as it passes through air. This explains that “feeling of floating” that many divers experience at higher speeds. Motorcycles experience this too, but to a much lesser degree. And the lift forces seem to just about sufficient to pull up the rear of the rider’s shirt and expose his Calvin Klein underwear, but not enough to lift the motorcycle. And thus, motorcycles experience less aquaplaning due to lift forces as compared to cars and other heavy vehicles. Motorcycle riders all know that the front brakes are responsible for about 70% of braking forces. Now, if you hit the brakes hard enough, you’ll experience a force of being “jolted forward”. That’s momentum – a force you experience because a moving body tends to want to continue to move forward unless opposed by another force. Recall that the forces experienced on the rear wheel (acceleration) and the front wheel (braking) being different? Now, imagine during hard braking, any water trapped in those tire grooves and between the tires and the road surface, experience the same momentum forces too. It would “want to continue” in the direction of travel. And because of this force, the front tire’s groove pattern “forces” the water away from the centre of the tire, thus INCREASING road to tire surfaces grip – especially important for braking in wet roads. 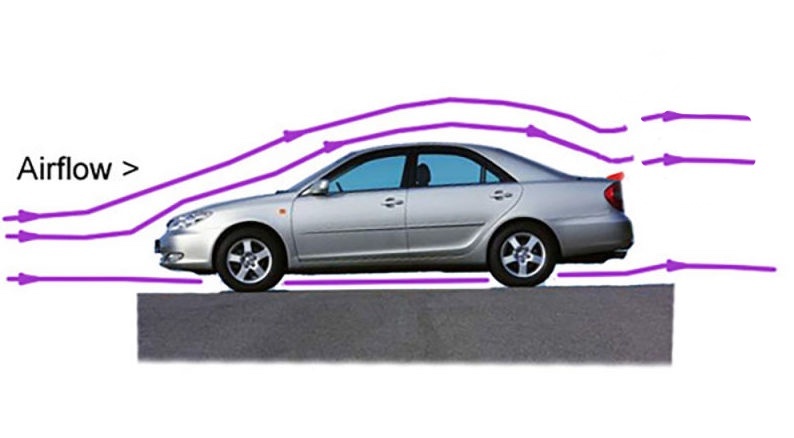 Momentum forces and the groove pattern displaces water from the front tire during braking. 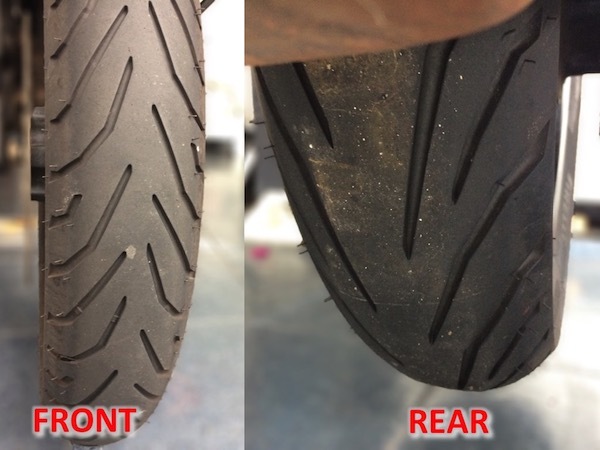 Now that you know how the front and rear tire treads of some uni-directional performance motorcycle tires work, ALWAYS check your tires when getting them installed. Make sure that the front and rear tires are where they should be, and that they are mounted in the correct direction of rotation. Especially, especially more so for the front tire – it might just save your skin when braking on a wet day. Question. Ok, that seems reasonable to put the front thread backwards. But, how many times do we brake on a wet road? Only once in a while right? I mean, the front tyre wont push the water aside if we are not braking, like when we are on a highway, we wont be using the brake for quiet a long distance. Thus, the thread will be pulling the water in between instead of pushing it aside. So, the question is, will the ‘backwards’ front thread have a downside when we are crusing on a moderate speed? Aquaplaning especially. Heya. It’s really not about “how many times we brake on a wet road”, but more of where the forces are concentrated at. During acceleration (and cruising), the rear wheel drives the bike and the forces are predominantly on the rear tires. Vice-versa for braking. The unidirectional tread pattern does exactly that. Now I don’t profess to be extremely knowledgeable in this, but I’m pretty darn sure the engineers in these tire companies know what they’re doing when designing performance tires, and have probably thought this through. I dont want to hydroplane, I just want to rocket up to speed and fly. The less I feel the road the better. Acceleration forces are not provided by the front wheel – it comes from the rear wheel. It’s not all just straight riding. Think about the fact that you actually counter-steer the front wheel to control the motorcycle… Think about how the grooves in the tyre are displacing water at a lean angle? If the grooves are the same as the rear tyre you’re not displacing the water with the front tyre. Your front tyre counter-steering at a lean angle would appear to static water as grooves straight across the tyre, thus not displacing water. But with what appears like a backwards tread pattern this is abated and water is displaced. Hey, I find your blog was very interesting and useful. Just made my decision on the Motul 7100 by reading your review of it. This may not related to the topic, but may I know your experience with the Pirelli Angel CT? Is it good though? It has so far been nothing but excellent with the Angel CT! I have a totally different theory. First of all, the rotational speed itself makes sure that no water remains in the grooves while rotating. 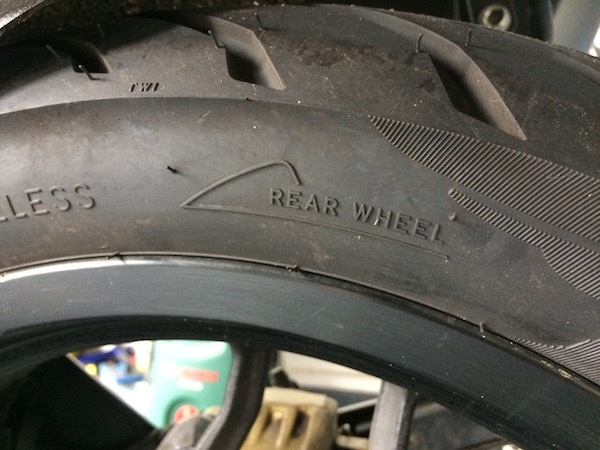 then why rear tyre tread is pointing forward? 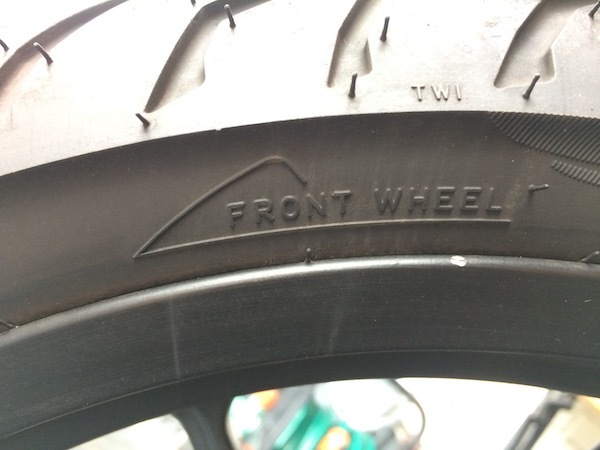 rear tyre tread is pointing rearward and front tyre tread pointing forward…. also because of the shape of the moto tyres have a tube shape when rotating water ALWAYS travels from side to center due to centrifugal forces…. I love physics I understand it well. has no air resistance and deals with much less water…..
Rear tire is pointing forward because u must understand how a bike turns. While the front will dive into the inside of the turn, the rear under power will move outside of the turn, hence, for the front, you want the water to be displace to the outside of the turn, while for the rear, to the inside of the turn. I’m not quite sure why you would want to do something like this? There are a few companies that make “wide front tire” kits for Harley FLH and FLT. They use 180/55R18s on an 18×5.5 rim. I am installing one on my 2015 Road Glide. I can’t find a 180/55R18 “front” tire. I plan on installing a rear tire in reverse as a front tire. My 1994 Fatboy had the same size front and back tires. I installed a rear tire on the front once, because a front tire was not available. I reversed the rotation so the tread direction would be correct for the front. It worked just fine for the entire life of the tire. Depending on the state, you may have problems passing the annual state safety inspection with a rear tire on the front rotating opposite the arrow direction. 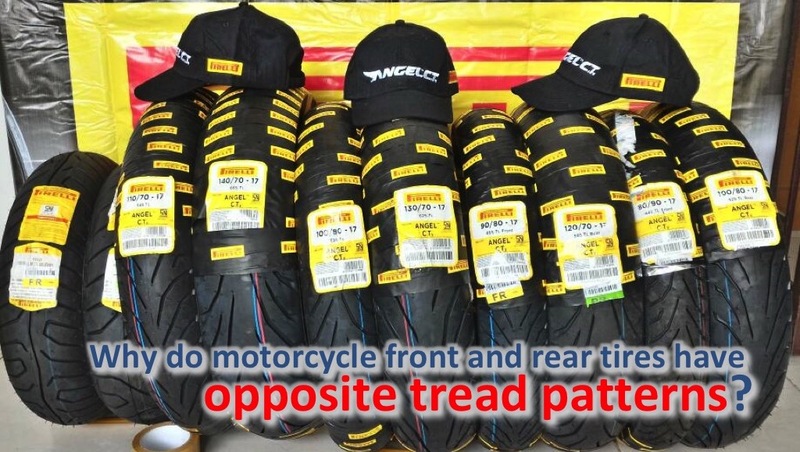 I just bought the Pirelli Angel CT and since that I’ve been scratching my head whenever I try to find a logic reason for a opposite thread pattern on my front tire. Now it’s all good. Thanks. You help me conclude my confusion. Glad it helped you! Ride safe! I just bought the Pirelli Angel CT and since that I’ve been scratching my head whenever I try to find a logic reason for an opposite thread pattern on my front tire. Now it’s all good. Thanks. You help me conclude my confusion. I was thinking the same thing. It’s quite funny how many people spelt tread wrong, including in the article. Great article tho, I’ve always wondered about the front tyre tread being reverse direction. Why would you let the shop sell you a wrong tire? You’re correct – some tire manufactures use different compounds for front and rear tires. It’s not as simple as flipping the tires around in a different rotational direction. The design engineers would have thought this out if the tires were actually designed as front and rear tires. To me this is a very arguable topic, every one knows that a dry track tire is all about compound and adhesion, wet track tires should all be about getting rid of the water to allow both acceleration & braking, why should the front tires be doing the opposite from the rear? ie pumping water to the center of the tires? to me it simply doesn’t make sense. For the exact same reasons why front and rear tires are sometimes designed with different compound construction – they experience different forces, and are thus optimised for such. Once the front tire is sliding upon braking, the idea that water is being directed to the center is out the window. It is then being squeegeed to the outside. Same thing with the rear. Once it is spinning under acceleration, again, it is being squeegeed to the outside. I still am not sure why cars are different. Therein lies my confusion. I am still confused. Surely the tread is only there to pump water away from the contact patch. It is not there to transfer forces, braking or accelerating. (that is why dry road race tyres have no tread) If the front tyre tread direction is opposite the rear tyre, facing inwards to the centre of the contact patch while rotating forward as my Michelin Road 5’s indicate then I assume this would force the water inwards also. Maybe while braking, the momentum outwards might overcome the tread forcing the water inwards but why not face the tread so it assists to continue forcing the water outwards. I also agree that the most likely time you are going to want the water pumped away from the contact patch is when cornering on a steady throttle. That is when the bike is most likely to lose grip and crash. Not much acceleration or braking happening then. Even if there is acceleration or braking, I can’t see how pumping the water towards the centre of the front wheel contact patch can be better than pumping it away like the rear tyre does. I think it’s because the designers are optimizing for exactly that – the cornering scenario, when lateral grip is most important. If you think about where the contact patch is on the tyre when the bike is leaned over, the tyre is not moving water toward the centre, but rather from the inside of the turn toward the outside. The rear tyre needs to channel water away from the centre most often in a straight-ahead/acceleration scenario, hence the car-like tread pattern. Someone mentioned putting a rear tire on the front and reversing the arrow direction. This then makes it the same as a rear tire ? Or do front tires have more tread design and rear tires have more solid rubber which makes it more likely to slip on a wet road ? As far as my riding goes, I am more or less a fair weather rider anymore. Getting too old to ride in the rain. If I ride only on dry roads, does a front, rear , directional arrow, or tread make any difference ? This then makes it the same as a rear tire ? This then makes it the same as a front tire ? It still doesn’t make sense as far as pushing water out of the way. But I’m sure the manufacturers have done some testing that contradicts common sense. i have a sym now is 155 cc before had 110/70 /16 tyres , the handlig was not great, now i fitted a 120 /80 /16 on front a pirelli rear tyre fitted unticlockwise,as it would not fit to the rear due to bike frame size. And then I fitted a 110/75/16 on the rear but the tyre its a front tyre and has a water rim in the center. However the bike now its a much better safer and handles well, its a different bike. My question is , withouth any doubt a sligtly larger tyres improves the handling and its safer, so why motorscooter factories dont fit larger tires on the bikes , but only provide tiny low profile on them when they sale . That is counter intuitive, the reverse pattern at the front will only push water to the center of the tire, that is not the reason why its there. A good rain tire will have a center line, most performance tire have the reverse tread because when the bike is leaned over, the tread would push the water away to the outside of the lean better, if the tread is not reversed, when leaned over water will be pushed to the inside of the lean or the direction the bike is cornering / leaning into, which is bad as it will cause hydroplaning. When going on a straight line, it is not much of a concern as a bike can practically go on the rear wheel alone.